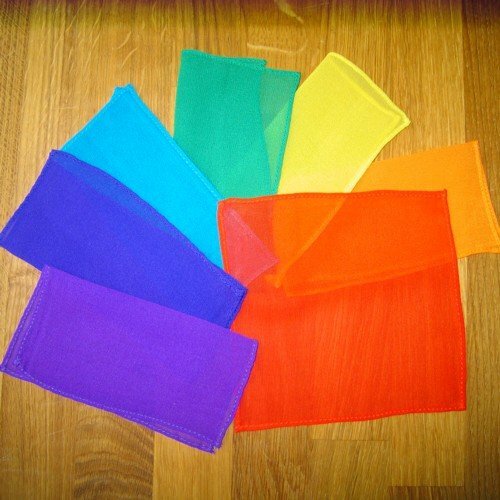 Colour therapy silk square set is made up of fourteen colours. Therefore, these are the perfect colour (color) therapy set for the serious therapist. Working with colour, chakra therapy, reiki, crystal healing, massage, hot stone therapy or other holistic therapy and beauty treatments? This is the set for you. Importantly, you will have each of the seven main chakras covered. In addition, useful colours used in more advanced and specific treatments. So, you will find red, orange, yellow, green, thymus chakra green/turquoise, light blue, indigo blue, purple, magenta, pale pink, pure white, silver colour, pale gold colour and rich copper gold colour. Each square measures approximately 36×36 cm/14 inches across. Red for the base or root chakra, orange for the sacral chakra, yellow for the solar plexus chakra, green for the heart chakra, turquoise/green for the thymus chakra, pale blue for the throat chakra, indigo blue for the third eye chakra, violet purple for the crown chakra. The other colours are used for the higher chakras or for other specific uses in holistic and color therapy treatments. 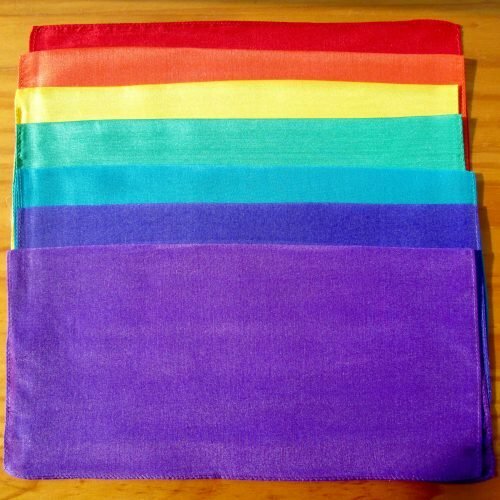 Your “colour therapy silk square set” is made with a nice, light weight pongee silk. Importantly, each square of your “colour therapy silk square set” is printed and can be hand washed. Use a gentle washing product, hang them out to let them dry naturally, then iron if required on a gentle silk setting. Wash each colour separately. Previously, I hand painted these squares. 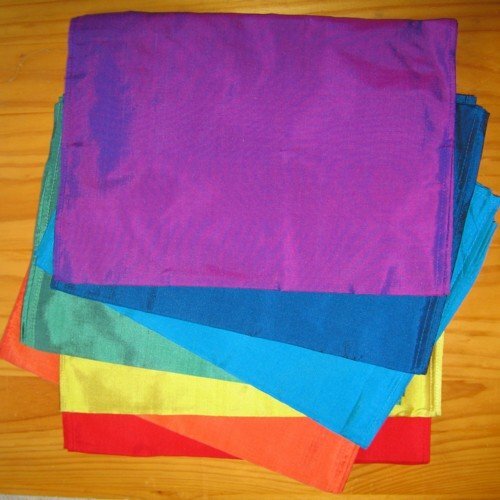 However, I find that the vibrancy of the colours and quality of the silk is better with these printed silk squares. I’m very happy with the result and these are rapidly becoming one of my best selling chakra sets. I hope you enjoy working with your “colour therapy silk square set”. 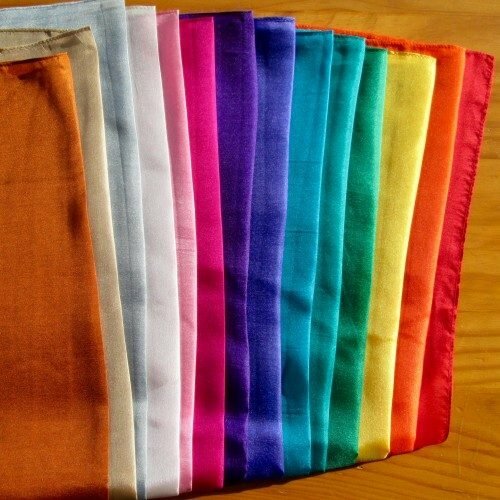 Your “colour therapy silk square set” is supplied neatly packaged. Fabulous silks and so pleased with the colours. Plus order arrived quickly with silks well packaged! Can’t wait to start using them! Beautiful Silks- just what I wanted. Arrived promptly and safely with added instructions on the back of the packet re- delivery notice. Thrilled!